Once you have purchased an ADT Pulse Camera and have installed it successfully, you’ll be able to view the camera live. But your ADT Pulse Cameras won’t record anything if you don’t set them up to do so. There are three ways you can set up the cameras to record. 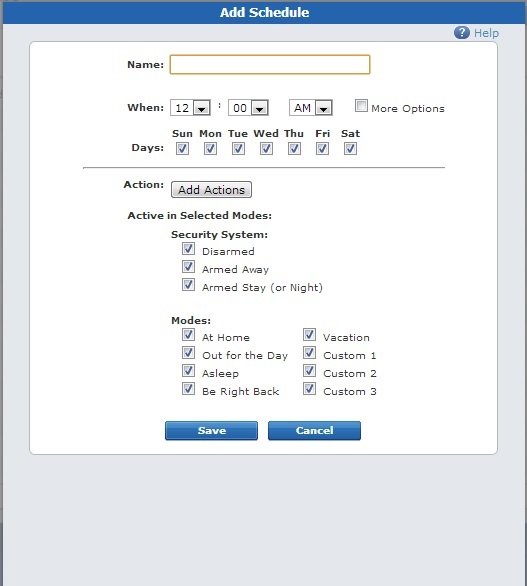 They are the tabs across the top of your ADT Pulse Portal: Alerts, Automations, or Schedules. 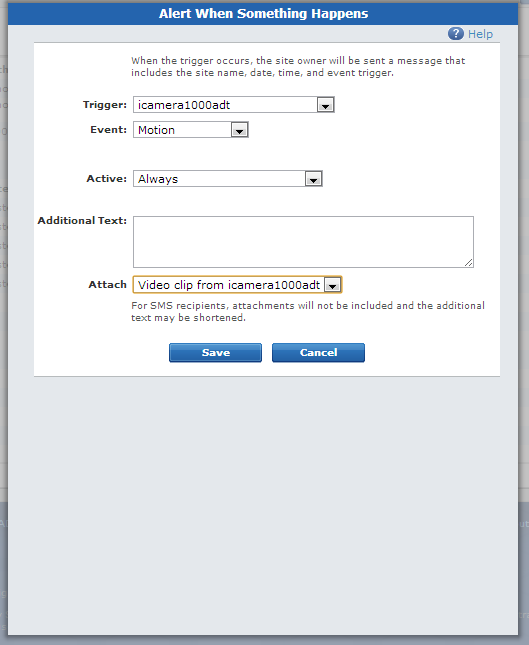 If you want to get an email notification with a video clip or a picture, this is the setting you would want to use. Click on Add Alert. Then choose one of the three options: when something happens, when something doesn’t happen, or when a system event happens. You can then choose a trigger, which can be the camera itself or another device on the system. Then choose if the event is motion or no motion. The next choice is always or on a schedule. Lastly, you will choose if you want a photo or video attached to the email. This is where you will want to go if you want to set up the camera to record if there’s motion, especially if you don’t want to get an alert each time there’s a new 30 second clip. This is what I recommend to everyone when they get their ADT Pulse Cameras installed. Right now, you can have unlimited 30 second clips that stay online for 30 days. You will set this up almost the same way. 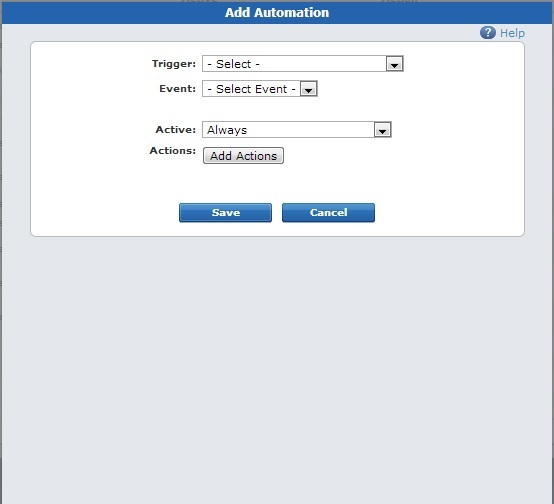 Click Add Automation, select a trigger (probably the camera), select an event (probably motion), and then you can leave it to always do it. The last part is if you wanted an automation (like if there was motion turn a light on). But you don’t need that if you just want video recording all the time. Schedules only has an option to take a picture and not one to record a video. So it’s limited in that regard. But if you wanted to get a random photo every day between certain hours, this is the option for you. Click Add Schedule, put in a name for it, choose the time and days you want it to run, and then choose the action. This can also be used to automate lights turning on and off during a time frame. Those are the 3 ways you can make sure you are getting images or video recorded from your ADT Pulse Cameras to your pulse portal. That way, if something happens at your home or business and you want to go back and see the footage, you can. My Pulse system doesn’t show a camera as a possible trigger. (I have 2 cams). It only lists the motion detectors and door sensors. Do you have the RC8021 Camera that is white or one of the other 3 cameras available? I have the white cameras that record motion but I don’t have this option either. Yes the white RC8021 cameras are the first and most basic ADT Pulse Camera. After that one ADT replaced it with the 8025 which can record on motion. What is the reset time after recording a 30 sec clip? I.e. My wife came home from work tonight. It took her more than 30 seconds to get in the door. If she is still out there making motion should it automatically snag an additional 30 second clip? It means there is a message recorded. Sometimes people record the message on accident. IF you push Function (#) and then Record (1) you will record a message. IF you push function delete you will delete the message. You can play it by pushing function play. Sometimes you need to play the message before you can delete it. The reset (interval) time between clips is 5 minutes. i have the NV412A with a analog camera can this camera be used as a trigger? To my knowledge it cannot be used as a trigger. You must use other inputs as triggers. It is recommended to have a DVR to record the analog cameras since a DVR can record on motion. We had a power outage a few days ago and my camera has not recorded a video or image (motion) since then. I am able to manually take a picture but not video. Can someone help me with this!?! All my settings seem to be correct. If you have the automation set up properly you could try powering down the camera and powering it back up and see if that solves it. If not call ADT And have them look from their end and maybe they can see something you are missing. I want to extend my video clip time of 30 seconds to a longer time. How do I go about doing this? I would recommend a wired IP Camera system if you want longer clips. I have an alert and automation set up for my camera but when I get one and I go to either the Pulse app or the portal from my laptop/desktop there are no videos or clips available. Any idea on how to fix this? I have a camera that is set up to capture clips with motion. It was working fine until about two weeks ago. It stopped recording video clips. I checked the settings and they have not changed. I am able to see live footage. How do I get the camera to record video clips? Is it an ADT Pulse Camera? I would call ADT and have them look at it if so. Hello, Is it possible to limit where in the camera’s view that will trigger the recording of video clips, like a grid system? Also, is the system recording at all times or only when triggered? I can see the series of 30 second clips. I get a great number of nuisance clips from cars at a nearby intersection. Great question, right now there is no way to mask areas to ignore or to trigger motion. So the cameras might record lots of 30 second clips when you do not want them to. If you remove notifications it wont be as annoying since you will not get an email or text notification every time. 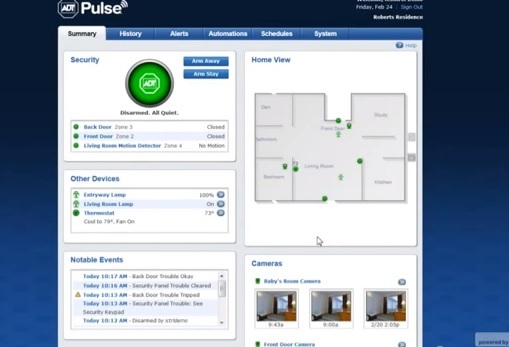 There are more expensive camera systems that we can help you with that have this feature, but the ADT Pulse Cameras do not have it and I do not think they will anytime soon. You can delete clips by logging into the ADT Pulse Portal and looking at your clips, but they will automatically delete after 30 days. Also, deleting them does not mean you will be able to hold more clips or have longer recording times. The ADT Pulse Cameras can only record one 30 second clip every 5 minutes. Can you record longer then 30 seconds? My camera is not capturing when a car comes in the driveway or someone is walking up the walkway. The camera captures these two places live but not on motion clips. What can be the cause of this?